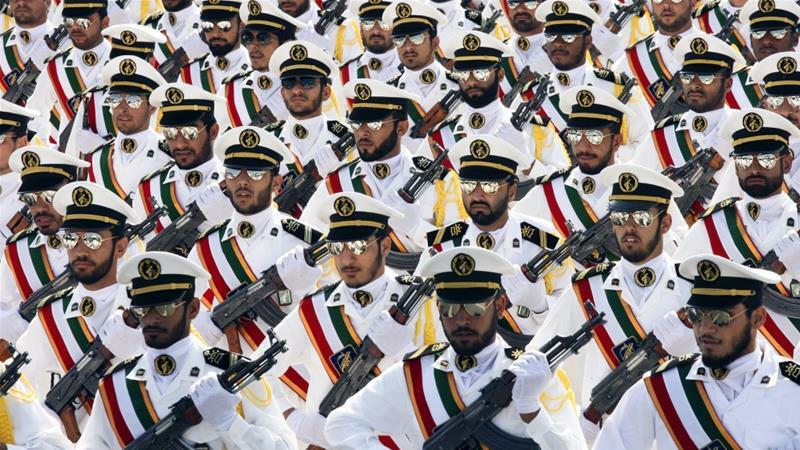 President Donald Trump announced Monday that the U.S.is designating Iran's Revolutionary Guard a 'foreign terrorist organization, ' in an effort to increase pressure on the country that could have significant diplomatic implications in the Middle East. Speaking before a group of IRGC staff and their families on the eve of the National Day of Guards, Khamenei said that USA officials wishfully plot against the Corps and the Iranian revolution. Also on Monday, Iran responded by designating all USA forces as terrorist, and labeling the U.S. a "supporter of terrorism". The US move to designate IRGC as a terrorist organization has been negatively received by a number of countries. "No one in this world, no country on earth can claim that it has suffered more from terrorism than Iran". Iranian President Hassan Rouhani slammed the move as an "illegal act" prompted by Tehran's growing power on the world stage. Labelling the Guards as a terrorist organisation will allow the U.S. to impose further sanctions - particularly affecting the business sector, given the IRGC's involvement in Iran's economy. Cavusoglu added Turkey had itself opposed the Revolutionary Guards' actions in Syria. Beijing is one of Tehran's close economic partners and also sided with Iran and Russian Federation in the Syrian conflict. The IRGC has been implicated with terrorist plots against the USA military and funding other known terrorist organizations such as Lebanese Hezbollah. Iran's foreign minister, Mohammad Javad Zarif, seemed to anticipate the designation, saying in a tweet Sunday aimed at President Donald Trump that Trump 'should know better than to be conned into another USA disaster'. "Once again you are keeping the world safe from Iran [ian] aggression and terrorism", Netanyahu said. America will not be able to "block Iran's progress", he said. It has further isolated this arm, the Islamic Revolutionary Guard Corps, placing it in the same rogues' gallery of designated Foreign Terrorist Organizations as ISIS and al Qaeda. Tehran swiftly retaliated by blacklisting US Central Command as a terrorist organisation, affecting US troops serving in the wider Middle East from the Horn of Africa to Afghanistan. Iraq's prime minster says his government tried to stop the US from labelling Iran's Revolutionary Guard Corps as a "foreign terrorist organization", saying the designation could have negative consequences for Iraq and the Middle East. The interview was recorded before the US declaration on Monday. Iraq has prominent Iranian-affiliated Shiite militias and its government has strong ties to Iran.